For demanding applications that require filter housings with high purity or sanitary construction, reliability and durability, Shelco’s Filters’ MicroVantage™ filter housings offer the perfect choice for critical process streams. For a high flow, back-washable option down to 0.02 micron, a Liqui-Flux Ultra Filtration (UF) System is ideal. The Shelco Series Sanitary Housings feature high polish RA finishes and removable tube sheets for ease of cleaning and sanitization. All HP Series High Purity housings provide a cost-effective alternative for high-end industrial applications requiring housings with electro-polished finish, double o-ring cartridge connectors and other quality features. Shelco Filter’s Commercial and Industrial Multi-Cartridge Housings are recognized worldwide as the industry standard for high flow applications. Constructed of 304L or 316L stainless steel with either a clamp or swing bolt-style closures, these housings are the perfect choice whether it is a light duty or heavy industrial process. With flow rates that can exceed 1,000 GPM (3785 LPM), fittings that can be changed or moved to fit your specific needs and internals that can be made to accept your cartridge preference, these housings have the flexibility to meet your requirements. Shelco’s Jumbo Cartridge Housings accept a single cartridge that can handle flow rates of up to 150 GPM. The Jumbo Cartridges are made of polyester media that can be cleaned and re-used, providing a simple and cost-effective solution for applications with high solids contamination. 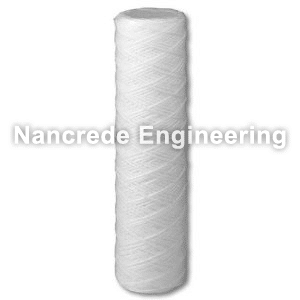 Contact us right now at info@nancrede.com or +1 888 56-WATER (569-2837) to buy or learn more about industrial Shelco or Ultrafiltration (UF) water filters, or for rapid response service in Indiana, the Midwest and throughout the U.S. for your industrial water systems. Our experienced engineers are ready to help.